Walhampton is a high quality 9-hole course in a tranquil setting, bordered by woodland and overlooking the Solent at the southern edge of the New Forest. 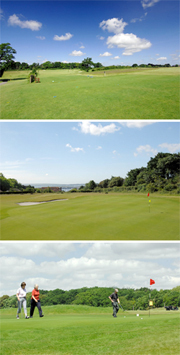 It is a relaxing environment to play golf in and the atmosphere in the clubhouse is friendly and informal. Walhampton challenges many preconceptions about 9-hole courses. The raised greens are constructed to the highest standard and the different levels and subtle borrows present interesting challenges. We are open to non-members but it is important to book as we hold regular members’ events and the course can be busy at peak times. Visitors can book up to seven days in advance and the booking number is 01590 689631 during clubhouse opening hours (7.30am until dusk). A licensed clubhouse provides for players’ basic requirements. We offer light refreshments and there are a number of excellent pubs, hotels and restaurants in the vicinity. We expect players to be appropriately dressed, reasonably familiar with the rules of golf and to conform to accepted standards of behaviour on the course. We reserve the right to refuse access if we are not satisfied that visitors meet the above criteria so please check with us if you are unsure. We can help beginners to get into golf in an inexpensive and structured way.